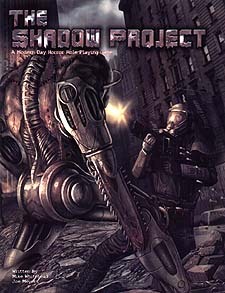 As Shadow Project soldiers, zombies are the least of your worries. Your team is the last line of defense against the DEVIL Virus and its terrible minions. In order to survive the undead hordes and technological nightmares you will need every bit of skill and cunning you possess. But even that might not be enough. Are you willing to sacrifice your humanity to save others from the DEVIL Virus's terrible grip? * Play the role of Shadow Project agents and embark upon chilling missions and adventures into the heart of New Prometheus - a sprawling metropolis infected by the DEVIL Virus. * Face terrible foes such as zombies, mecha-wraiths and abominations of flesh and machine. * Use special weapons to remove DEVIL Virus from monsters and weaken their powers. Then, distill the stolen virus into your own body to gain special powers and abilities! But be careful; as the level of DEVIL Virus grows within you, so too does its potential to destroy your humanity. * Complete rules for combat, character creation and more! * Twenty levels of DEVIL Virus powers to gain! * Detailed setting information gives Game Masters countless hours of frightening adventure ideas!